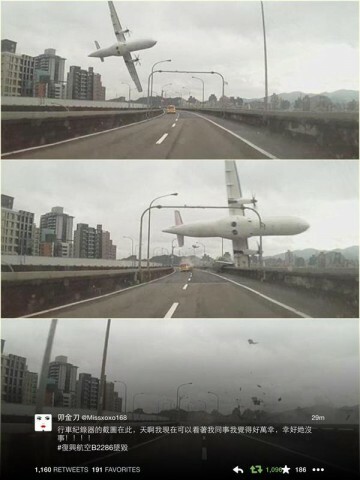 A Taiwan flight with 58 people onboard lost control and clipped a bridge before landing in a shallow river in the region of Taipei. So far of those pulled from the wreckage some eight people are dead – the rescue mission is ongoing. The flight lost control just after 10am Taiwan time and clipped a taxi cab that was in the path of the airplane as it dipped sideways into the river. Parts of the wrecked fuselage of the turboprop ATR 72 jutted out of the Keelung River just a couple dozen metres from the shore near the city’s downtown Sungshan airport. The main section of fuselage was on its side, missing the wing that clipped the bridge in the images above.